France says its three-day aerial bombing campaign has inflicted heavy losses on Al-Qaeda-affiliated Ansar Dine rebel forces in northern Mali. 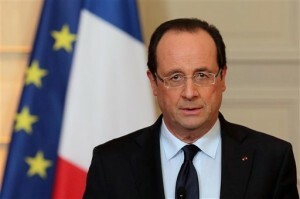 The French military mission, sanctioned by the United Nations Security Council, is meant to pave the way for the deployment of an all-African military force including troops from Niger, Burkina Faso, Senegal and Nigeria to repel the rebels. A 1,000-troop force from Niger and Burkina Faso is expected to enter Malian territory on Sunday and work alongside a 550-strong French force to secure the capital Bamako. France’s military intervention came after the Ansar Dine seized Konna, a town in central Mali centre which allows whoever controls it a measure of strategic advantage to launch an offensive toward the capital further south. Ansar Dine forces moved toward the towns of Mopti and Sevare, making them within striking distance of Bamako on Friday. French air strikes pushed the rebels back and allowed government forces to recapture Konna, a statement from the office of Malian President Dioncounda Traore said. The situation in Mali became unstable following a coup in March 2012 by military officers who were unsatisfied with the way the civilian administration was dealing with a Tuareg rebellion in the north. The military campaign in the north was halted thereby creating a vacuum, which was quickly filled by the Ansar Dine rebels who pushed back the Tuareg and then imposed a severe strain of Islamic law and began to capture towns in their southward push. An Ansar Dine rebel official told CNN Sunday that his forces had suffered heavy losses but vowed to fight on.